You’re Never Too Young is a slapstick-with-songs remake of the 1944 Ray Milland/Ginger Rogers vehicle The Major and the Minor. Dean Martin plays the Milland part, while Ginger’s shoes are filled by…Jerry Lewis? Lewis plays an apprentice barber who inadvertently crosses a homicidal jewel thief (Raymond Burr) and equally inadvertently hightails it out of town with the crook’s jewels in his possession. Desperate to escape the crook’s clutches, and lacking the necessary funds for a train ticket, Lewis disguises himself as a 12-year-old boy so he can travel half fare. He latches onto Dean, a music teacher heading for an all-girls school. After innumerable routines sparked by Lewis’s adolescent disguise, the jewel thief catches up with him, leading to a rollicking climactic speedboat chase. Dean Martin has plenty of opportunities to serenade leading lady Diana Lynn (who’d played a supporting role in The Major and the Minor), while Jerry Lewis is in peak form doing his usual “waah-waah-waah” schtick. The original Billy Wilder/Charles Brackett script for The Major and the Minor was reshaped into You’re Never Too Young by future bestselling novelist Sidney Sheldon. Bearing very little relation to the 1937 Paramount musical of the same name, Artists and Models is a lavish, girl-filled vehicle for the popular team of Dean Martin and Jerry Lewis. Martin plays Rick Todd, a comic-book artist who is under fire from his publisher (Eddie Mayehoff), who complains that Rick’s work isn’t gory enough. Lewis plays Eugene Fullstack, Rick’s roommate, who while asleep dreams up elaborate comic-book plots and garishly costumed superheroes. Eugene’s nightmares help Rick become a success; meanwhile, our two heroes romance their luscious neighbors, artist Dorothy Malone and rambunctious model Shirley MacLaine (who during one song wrestles Eugene to the floor and sits on his chest!) Eugene’s overworked imagination somehow attracts the attention of a group of Russian spies, who attempt to abduct Eugene during the annual Artists and Models Ball. Director Frank Tashlin uses Artists and Models as an excuse for some of the wildest sight-gags seen in a mid-1950s film. At one point, the director contrives to stuff a gag in Shirley MacLaine’s mouth. Tashlin also exhibits his ongoing fascination with female breasts and legs by giving ample screen time to the natural attributes of co-stars Anita Ekberg and Zsa Zsa Gabor. One of the best of the Martin/Lewis efforts, Artists and Models suffers only from being about 20 minutes too long. 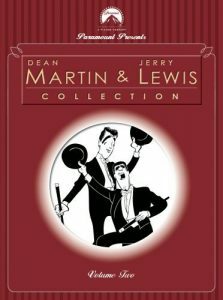 This Dean Martin-Jerry Lewis romp is liberally based on the 1936 Bing Crosby film Rhythm on the Range. Set around 1910, the film stars Lewis as the pampered son of female tycoon Agnes Moorehead. Yearning to return to the Wild West where his father was a famed peacekeeper, Lewis purchases a prize bull, destined for the ranch inherited by rodeo star Dean Martin. It so happens that Martin and Lewis’ late fathers were “pardners”, so Martin takes it upon himself to protect Lewis from the various and sundry tough hombres in the region. Through a series of bizarre plot convolutions, Lewis gains a reputation as a rootin’ tootin’ gunslinger, and in his hubris he decides to round up a gang of outlaws headed by Jeff Morrow. As a result, he nearly gets himself blown to smithereens, but Martin shows up in the nick of time to rescue Lewis and help him capture the bad guys. Lori Nelson and Jackie Loughery supply the film’s peripheral romantic angle. Pardners ends with Dean Martin and Jerry Lewis turning to the camera and promising that they’ll keep on making pictures for their faithful fans; ironically, the team was breaking up even while the cameras were turning. Dean Martin and Jerry Lewis made their last joint film appearance in the girl-filled musical Hollywood or Bust. The thinnish plot finds inveterate film fan Jerry making a cross-country journey to Tinseltown for the purpose of meeting his favorite screen star, the buxom Anita Ekberg (the film’s title, need it be added, has a double meaning). Dean goes along for the ride, hoping to expand his bankroll during a Las Vegas stopover. The boys are joined by a third traveler, an enormous Great Dane named Mr. Bascomb; along the way, the trio becomes a quartet when pretty Pat Crowley hitches a ride. The finale takes place in Hollywood, naturally, as Jerry wreaks havoc at a film studio which looks suspiciously like Paramount. All reports indicate that Hollywood and Bust was an unhappy shoot, with Jerry Lewis behaving so obstreperously that director Frank Tashlin ordered him off the set and told him to go home until he learned to behave himself; to this day, Lewis cannot bring himself to watch the film. Happily, the animosity between the two stars never comes across on screen, and as a resultHollywood or Bust is a most enjoyable diversion.